Markets moved up last week on news that the Federal Reserve will delay tapering until economic data improves. Despite some end-of-week jitters about Washington's debt ceiling debates, the major indices all closed in the black. For the week, the S&P 500 grew 1.3%, the Dow gained 0.5%, and the Nasdaq increased by 1.4%. Despite weeks of hints and rumors, the Federal Reserve did what few analysts expected at last week's FOMC meeting and decided not to taper - at least for right now. There were a lot of reasons cited by Fed Chairman Ben Bernanke for his decision to postpone the taper. During his press conference after the FOMC meeting, Bernanke said that recent economic data has not been strong enough to justify scaling back the $85 billion in bond purchases ($40 billion in mortgage-backed securities and $45 billion in Treasuries) that the Fed makes each month. An important takeaway for investors: While the call to taper could come later this year, it depends entirely on economic progress. Another factor that played into the Fed's decision not to taper were headwinds from the debt ceiling debates in Washington. While Bernanke downplayed the importance of a political showdown on long-term economic growth, investor fears could cause markets to scale back the year's rally. The debt debates are getting a lot of press and we want to use this opportunity to dig a little deeper into what Act III of the debt ceiling issue may mean for markets. For the third time in three years, Washington is facing a budget impasse that could force a federal government shutdown and a default on U.S. debt. Congress faces an Oct. 1 deadline (the current fiscal year ends on Sept. 30) to pass a budget or shut down the government the next day. If a 2014 budget is passed, the debt ceiling - the Treasury Department's authority to borrow money to meet government expenses - must also be raised or the Treasury will reach its spending limit some time in mid-October. A common misconception is that the debt ceiling involves new spending; it actually doesn't, it is designed to give the Treasury the ability to spend money that Congress has already authorized in their budget. The federal government actually hit its spending limit in the spring, triggering a series of "extraordinary measures" that the Treasury has used to keep spending under the ceiling; these measures, along with an increase in government tax receipts, have kept the government funded. However, all these budgetary gimmicks have run out and Congress and the President must now deal with the issue or risk forcing the U.S. to default on its debt. While we don't think it's likely to happen, a debt default would have serious repercussions for U.S. international credibility and the credit rating on Treasuries. Currently, a lot of maneuvering and politicking is going on in the House of Representatives, the Senate, and the White House as both sides stake out their positions. As was the case earlier in the year, Republicans are threatening to withhold approval of a debt ceiling increase unless the increase is accompanied by spending cuts. Most of the spending cuts demanded by Republican leaders are in "Obamacare," the Patient Protection and Affordable Care Act, which will start rolling out insurance exchanges on Oct. 1. Democrats are completely opposed to defunding Obamacare and will reject any compromise that includes doing so. Politically, both parties are split. The President's relationship with Democrats in Congress has been frayed following disagreements over Syria and the nomination process for the new head of the Federal Reserve. Republicans are also deeply divided over their tactical approach: Some moderates want to avoid tying the debt ceiling showdown to Obamacare, angering their Tea Party colleagues. There are several bills being passed around the House and Senate that would temporarily fund the government through Dec. 15, thus avoiding a shutdown, but kicking the can down the road yet again. It's unclear what effect these bills might have on sequestration or government services. It's also difficult to say what Washington will do: Take on the hard work of hammering out a budget and debt ceiling compromise now or keep procrastinating. We do expect a resolution to the issue before the end of the month, but we don't know how permanent that decision will be. How will these political maneuverings affect markets? It's impossible to know for certain, but even going back to the government shutdown in the 1990s, these political battles have had little long-term effect on markets. While we do ultimately expect the debt ceiling issue to be resolved without a government shutdown or debt default, short-term volatility is likely as investors wait out the fractious political process. When markets are volatile, it's important to remind ourselves of how far we've come. 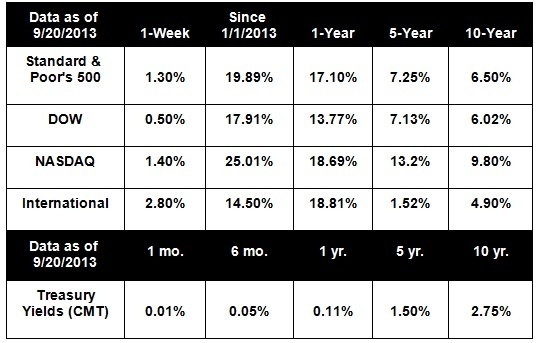 So far, 2013 has been a fantastic year for stocks and multiple indices are near historic highs. Ultimately, short-term market gyrations don't have lingering effects on long-term market performance and we always want to remain focused on our long-term goals. We hope you will agree that one of the benefits of working with our firm is the confidence in knowing that you have experienced professionals by your side. If you have any questions about how the debt ceiling debates or any other issue may affect your portfolio, please give us a call. We're always happy to hear from you. Industrial production jumps in August. U.S. factories increased output by the most in eight months, boosted by robust auto production. Automakers are stepping up production to meet demand, leading analysts to hope for a sustained increase in manufacturing production this fall. Housing data mixed in August. Existing home sales hit a 6 ½ year high in August as buyers rushed to lock in low mortgage costs amid rising interest rates. However, housing starts - a measure of new construction - missed expectations, leading to worries that higher mortgage rates may take a bite out of homebuilder confidence and housing demand. Jobless claims increase, but less than forecast. While fewer Americans sought unemployment benefits last week than expected, processing issues may have kept the number of applications artificially low. A significant number of claims have been delayed as two large states work through backlogged applications. This means that jobless claims may rise in the weeks to come as those delayed applications are processed. China's economic growth may be threatened. While recent economic data out of China has been positive, analysts warn that the pickup is due to a relatively narrow segment of the economy - state-led industry - that is unlikely to sustain its growth in the absence of continued central government support. As China seeks to normalize its economy and remove policy support from key industries, its economy may temporarily falter.